One very interesting document in the Eileen Ryan Collection comes from 1922 and was written by Erskine Childers. It is 16 pages long and I'll publish it in full here in four parts. 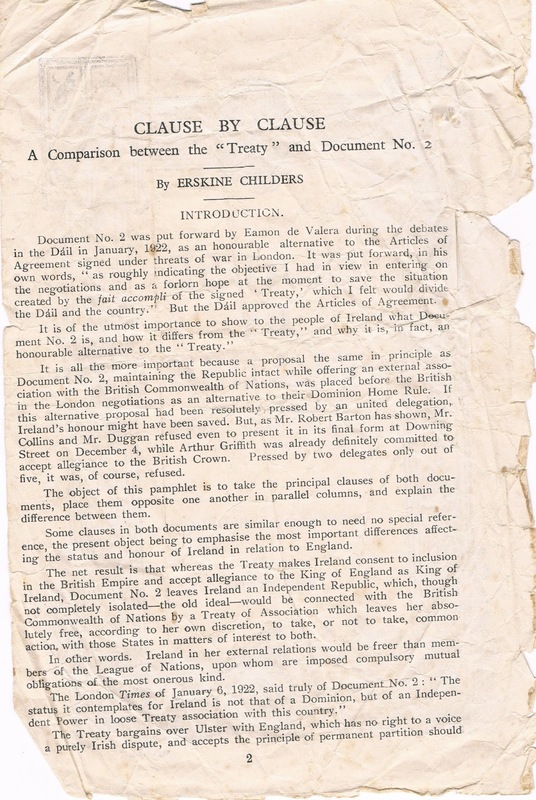 In the document, Childers shows on one side of each page the treaty signed with the British on 6th December 1921, and on the other side an alternative version known as "Document No. 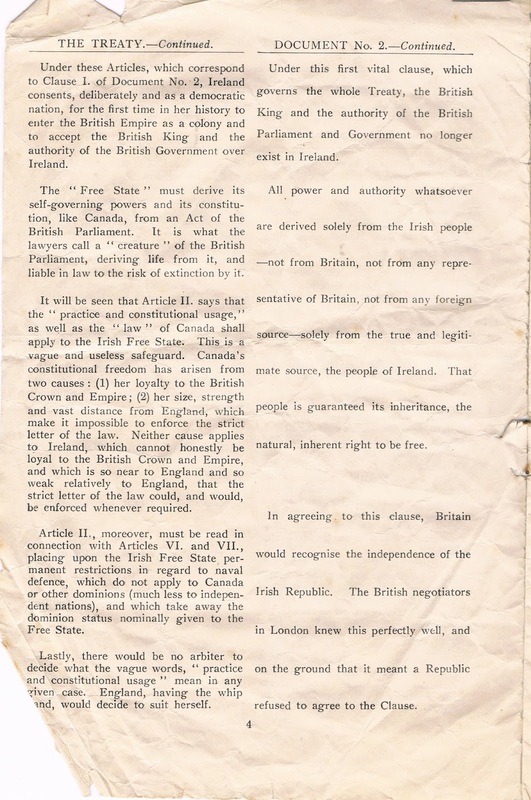 2" written by Éamon de Valera. 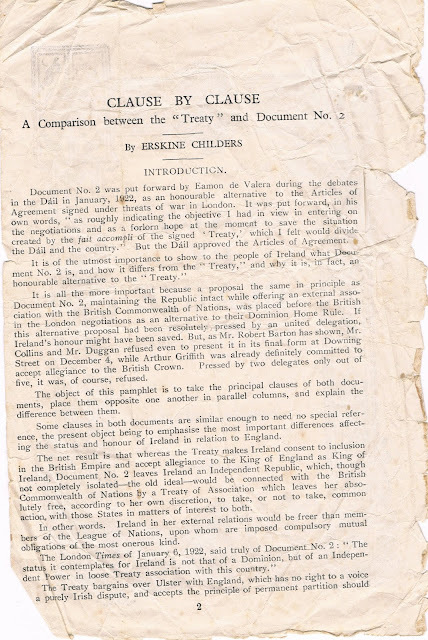 During the treaty debates, de Valera opposed the Anglo-Irish Treaty, but his "Document No. 2" was defeated in a Dáil vote. He subsequently resigned from the Dáil and the Civil War started shortly afterwards. It is amazing to think that in just over five years after the 1916 Rising that Britain signed a treaty with Ireland establishing the Irish Free State. 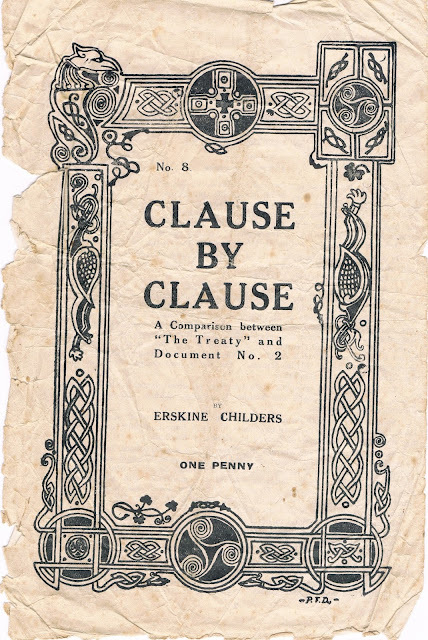 Childers wrote the document below probably before hostilities broke out in the Civil War - he was firmly on the Anti-Treaty side, as no doubt was Eileen Ryan since she obviously possessed this document and it was kept in her family for nearly 100 years. 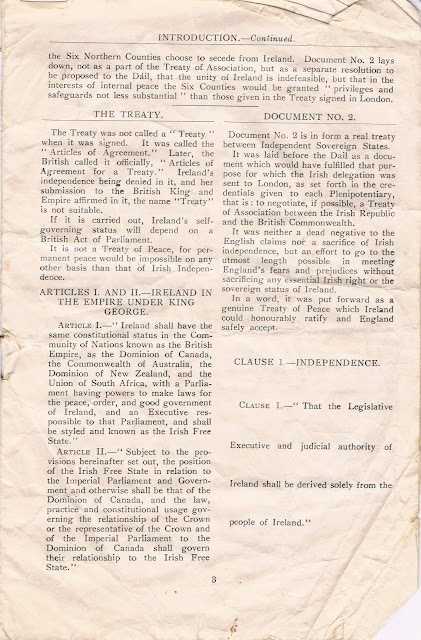 Copies of the document are available in the National Library of Ireland where it states that it was published in Dublin by the Irish Nation Committee in 1922. In the document Childers attempts to "explain the difference" between the Treaty and Document No 2. The first difference is over whether the Treaty was a "treaty" or not. Childers states that it was not a "Treaty of Peace" as the dominion status offered by the treaty could not compare with true independence. You can also see below that de Valera's document was a lot shorter than the treaty as the type is spread out. Childers calls Document No. 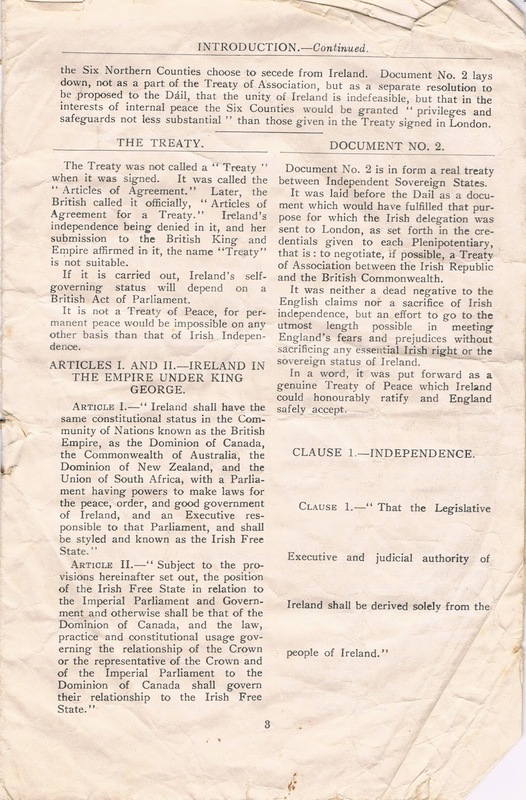 2 a "real treaty between Independent Sovereign States" - clearly the British did not yet see Ireland as a real country while the anti-treaty leaders like de Valera and Childers wanted a lot more. The difficulty of Northern Ireland as part of any negotiations gets a mention at the bottom of page three and top of page four - Document No 2 says that the "unity of Ireland is indefeasible" but interestingly it does offer "privileges and safeguards not less substantial" to the "Six Counties" than those offered in the treaty.